Forty minutes on the Windward side of Oahu is the Kualoa Ranch, a 4,000 acre private nature reserve and working cattle ranch and popular filming location for such popular movies like Jurassic Park, as a matter of fact the valley where you ride on the 2 Hour Horseback is often referred to as Jurassic Valley where the Dinosaur Scene was filmed. There is a special raincoat for horseback riding that won’t scare the horses and backpacks are not allowed on the horses. All riders must sign a liability release and are expected to proceed at safe speeds and stay on trails. Safety is as important for the horses and riders as it is to have a good time. Sometimes, the tour guides don’t allow riders to get off the horses to take pictures. 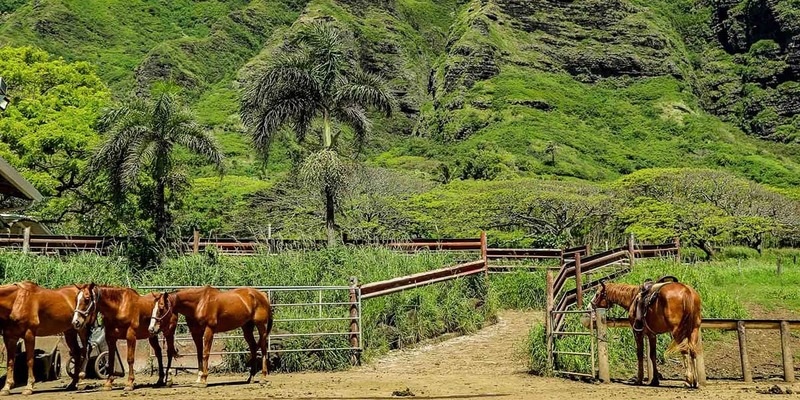 Kualoa Ranch has well-trained horses. 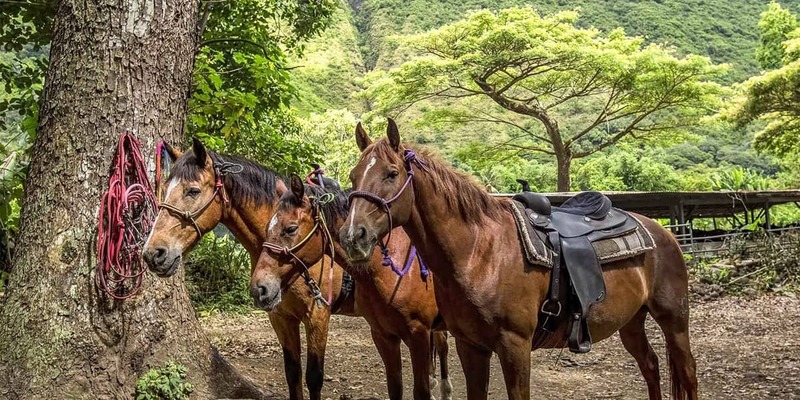 Horse riders can ascend mountain trails to reach the heights of the Hawaiian mountains and look out over the cliffs at the waves crashing below. 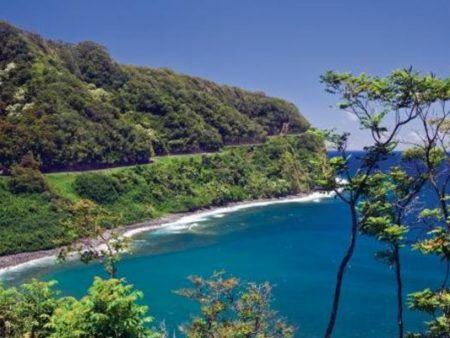 There are tremendous panoramic views of the warm inviting Pacific Ocean awaiting the enterprising and adventurous tourists.The Kualoa Ranch 1Hour Horseback Adventure tours the southern side of the ranch. Here you will pass along Kualoa beach (also called the Chinaman’s Hat Beach). The yellow sand awaits the beach goer. Across the bay is the “Chinaman’s Hat” (Mokolii Island). The legend behind this Chinaman’s Hat Island is that Hi’aka, Pele’s sister, slayed a dragon and the body of the dead dragon formed the Kualoa cliffs. 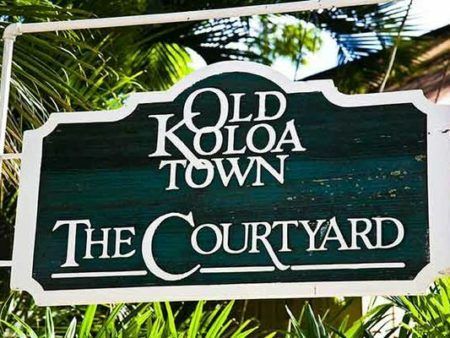 The Kualoa Ranch is located on the northeastern (windward side) of Oahu. 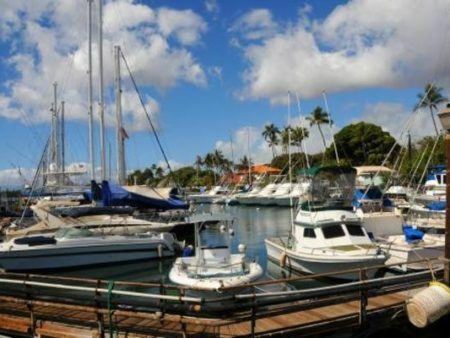 Hawaiians have always respected the environment and cooperated with nature. 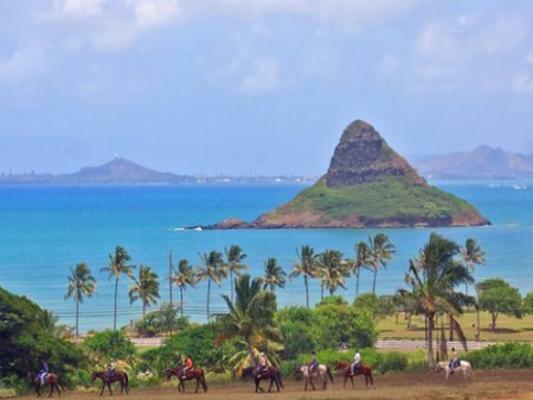 The Kualoa Ranch 1-hour horseback adventure usually occurs in the morning and afternoon. The horseback tour trails may be changed due to weather conditions, but tours usually still occur when there is wind and rain. Take a gentle adventure, returning to the ancient mode of traveling by horse. Feel the trail as your horse ambles along the trail. 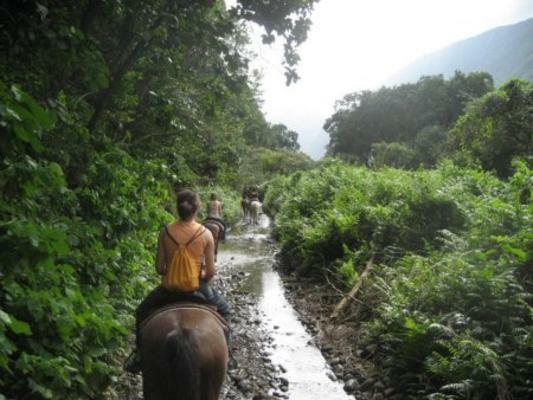 For more experienced equestrians, the Kualoa Ranch 2 Hour Horseback Adventure is a great option. 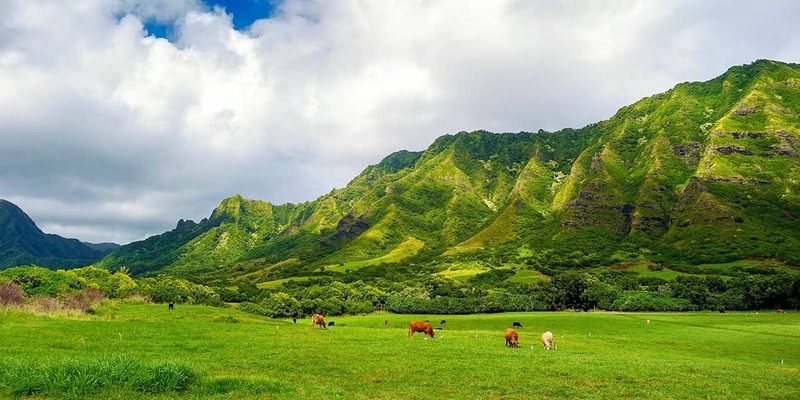 The Kualoa Ranch is located on the northeastern coast of Oahu and this 2-hour horseback adventure usually occurs in the afternoon. The horseback tour trails may be changed due to weather conditions, but these tours usually still operate in windy and rainy conditions. The horses are well-trained but even so, there are limitations on who can ride. All horseback riders must be at least 10 years old, 4’6” tall and weigh less than 230 pounds (104 kilograms). There are also no pregnant riders are allowed. Participants must be at least 10 years old, at least 4’6″ tall, less than 230lbs.